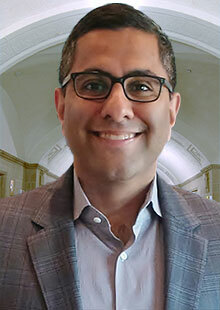 Home › Faculty & Staff › Dhir, Aaron A.
Aaron Dhir is an Associate Professor, with tenure, at Osgoode Hall Law School. His scholarly interests centre on corporate law, governance, theory, and accountability. He was the 2017 Justin D’Atri Visiting Professor of Law, Business, and Society at Columbia Law School and the 2013–2014 Canadian Bicentennial Visiting Professor of Law at Yale Law School. He has also served as a Visiting Professor at Stanford Law School and as a Visiting Scholar at Harvard University, the University of Oxford, Berkeley Law School, and University College London. Professor Dhir is the author of Challenging Boardroom Homogeneity: Corporate Law, Governance, and Diversity (Cambridge University Press, 2015; paperback edition, 2016) and has published widely in scholarly journals. He has contributed opinion pieces to The Atlantic, Slate, The Globe & Mail, and The Toronto Star, and his research findings have been covered by The New York Times, The Wall Street Journal, The Washington Post, The Harvard Business Review, Forbes, Newsweek, Vox, Pacific Standard, The Globe & Mail, The Financial Post, The Toronto Star, National Public Radio, CBC Radio-Canada, The Seattle Times, The Hartford Courant, Lexpert Magazine, TheStreet, El Mercurio (Chile), and ThinkProgress. Professor Dhir has participated as an invited expert in some of the most significant policy reform initiatives in his areas of expertise, including those convened by the Government of Canada, the Ontario Securities Commission, and the former United Nations Special Representative on Business and Human Rights. He began his professional career with one of Canada’s leading business law firms. He then made a shift to social justice advocacy and has acted on cases up to and including the Supreme Court of Canada. Graduate Research Supervision (LLM, PhD): Currently not available to supervise.